News of Muhammad Ali’s death broke just before midnight Friday, when most of America was settling down. Reactions around social media were swift, pouring in from every corner of the earth. 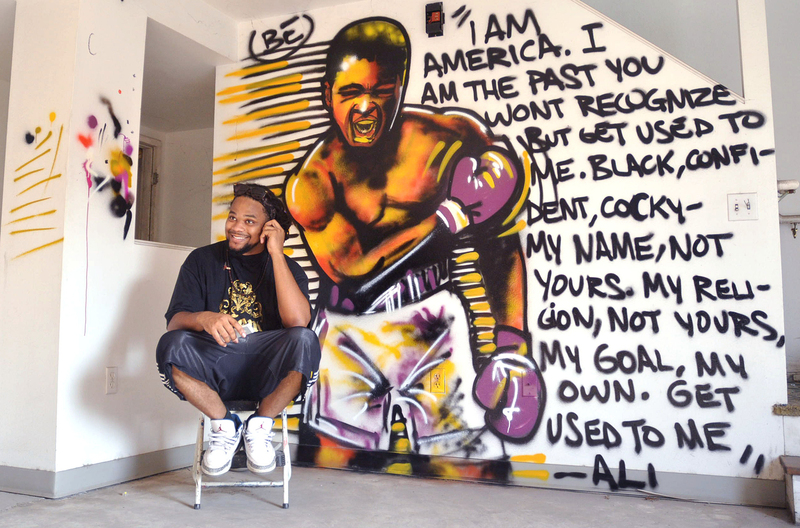 In New Orleans, artist Brandan Odums reflected in his own way, poring over various paintings he’s dedicated to Ali over the years. He took to social media to post images of the past, each holding specific memories. As commenters shared special messages beneath his posts, the paintings, too, became mini-tributes. Odums, 30, had prepared himself as best he could for the dreaded day the champ would depart his earthly life. A couple of months ago, he read an article that detailed Ali’s declining health. It was tough to process then, Odums said, but he continued to find ways to pay homage to Ali while the boxing legend was still living. Of all his paintings, Odums points to the Ali mural he composed at the Crescent City Boxing Club in New Orleans as one that stands out, specifically because of the symbolic meaning it holds for him. In college, Odums began painting historical icons on T-shirts and selling them for extra income. He carefully chose public figures whom not only he appreciated, but ones who were also relatable to others. Of all the iconic figures Odums has painted through the years, Ali remains a staple in his work. Odums began to read and research Ali’s life in and out of the ring, quickly realizing there was much more to the pretty, slick-talking champion from Louisville, Kentucky. From his stance on politics to his bold leadership in the civil rights movement, Odums saw a lot of himself in the boxer. 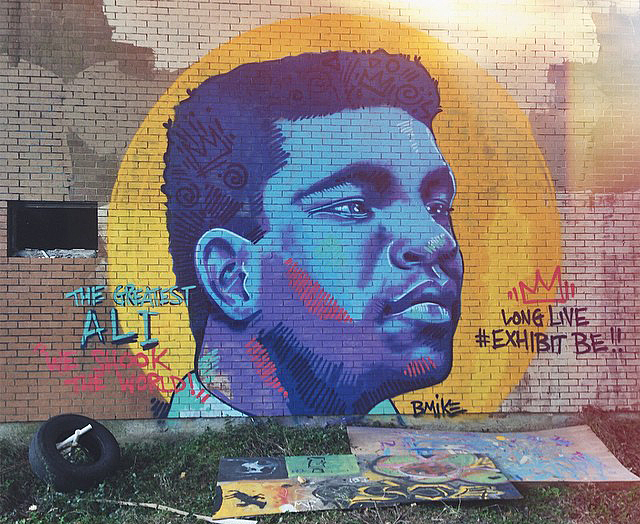 Drawn to Ali’s confidence, intelligence and tenacity, Odums began creating illustrious murals around New Orleans — in a dilapidated public housing development and later, an abandoned apartment complex — that captured snippets of the different chapters in Ali’s life. “If it’s anybody who spoke the loudest to me in history, it was Muhammad Ali,” Odums said. “It wasn’t just because he spoke loud in the interviews I saw or the clips that I saw, but it was the fact that he was such a dynamic and bold representation of black power, black masculinity — what it looked like when it’s done right. 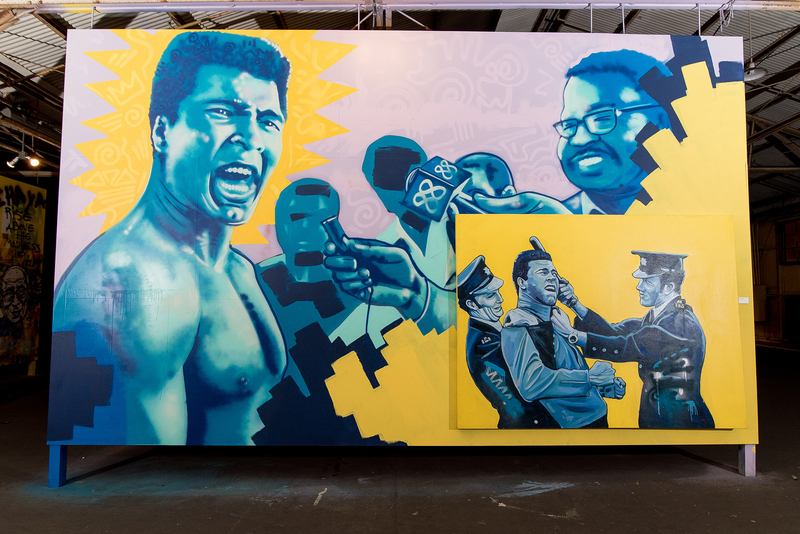 Odums’ paintings of Ali and other iconic figures are now housed and on display at his latest exhibit, Studio Be, in New Orleans.